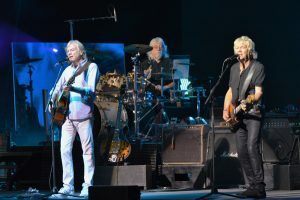 The Moody Blues stopped in at a packed Pier Six Pavilion on Wednesday night to take concert-goers back a half-century. The band’s landmark album Days of Future Passed turns 50 this year, and Moody Blues are marking the anniversary with a U.S. tour featuring a performance of the album in its entirety, along with several other treasures from their extensive catalog. 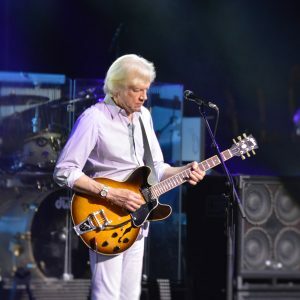 Moody Blues’ three remaining longtime members: Justin Hayward (guitar/vocals), John Lodge (bass/vocals), Graeme Edge (drums), and the rest of their backing band took the stage to a huge ovation. They began the show with the high-energy I’m just a Singer (in a rock ‘n’ roll band) featuring Lodge on primary vocals. Lodge remained out front on vocals for Steppin’ in a Slide Zone and moved forward in time to the 80s with Nervous. Hayward took over the lead vocal role for Your Wildest Dreams, one of their biggest hits from the decade that got the crowd on its feet and dancing. They next jumped back a decade or so for Isn’t Life Strange, with Hayward and Lodge sharing the vocals on a song that flowed from pastoral ballad to flourishing crescendo interwoven with flutist Norda Mullen’s beautiful melody. 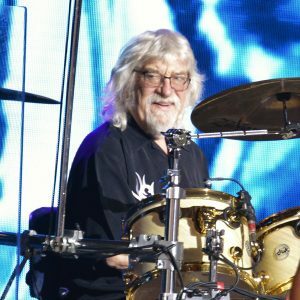 Graeme Edge, drummer of the Moody Blues. The set ended with two Hayward-led songs that highlighted very distinctive and differing sounds of the bands history, beginning with the very 80s pop/rock I Know You’re Out There Somewhere and moving back to a psychedelic fuzzy guitar, meaty bass and drums version of The Story In Your Eyes. Released in November of 1967, Days of Future Passed is credited as being one of the first progressive rock albums. Built on a base of lush symphonic elements courtesy of the London Festival Orchestra, and expanded with a combination of early psychedelia, rock and spoken poetry, it has become one of the essential albums for progressive rock devotees. The album’s popularity grew over time, reaching a mainstream audience and eventually peaked at number three on the Billboard U.S. charts in 1972, almost five years after its initial release. It also produced two hit singles, Nights in White Satin and Tuesday Afternoon, which charted at Nos. 2 and 24, respectively. As the concert’s second set began one thing was noticeably absent: musicians playing their instruments. Since much of Days of Future Passed is orchestral, including the opening song, and bringing along a full orchestra would be a bit too impractical, a recorded version was played with video montage. The poetry portion was spoken by a pre-recorded Jeremy Irons whose starkly displayed face over a cosmic backdrop was exactly what I imagined when I first listened to this album so many years ago. 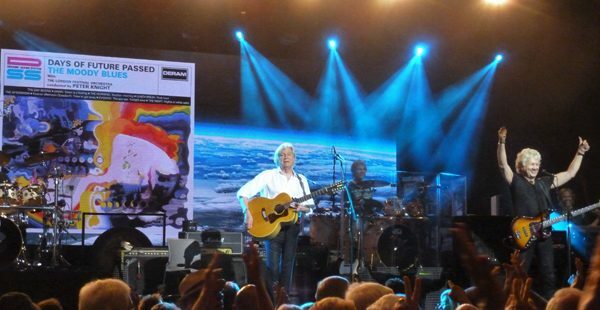 The Moody Blues played before a packed crowd at Pier Six Pavilion on Wednesday night. The initial sense of disconnect passed as the band moved into Dawn Is a Feeling and on through the rest of the album. They passed though the album’s conceptual ponderings of life reflected over the course of a day with a close respect for the original music. Wildflower fields, thriving city streets, and celestial imagery whirled through the accompanying video sequences, bringing a hypnotic effect to the performance. The highlight song for the second set was clearly Tuesday Afternoon. Played with a pause before jumping in, it was designed as a showpiece song for the night, with the audience joining in for an enthusiastic sing along and band feeding off the energy to give it that extra punch. Following the album’s performance, the band returned for a very energetic two song encore beginning with Question and ripping through Ride My See-Saw for the finale.